It was actually quite tough to find a relatively flat Crisp for comparison sakes, but with one as near as dammit in hand, it would have been safe to describe this as a dry and firm to the crunch. The munch lasted a good deal through the eating process and there was no mushy stage. 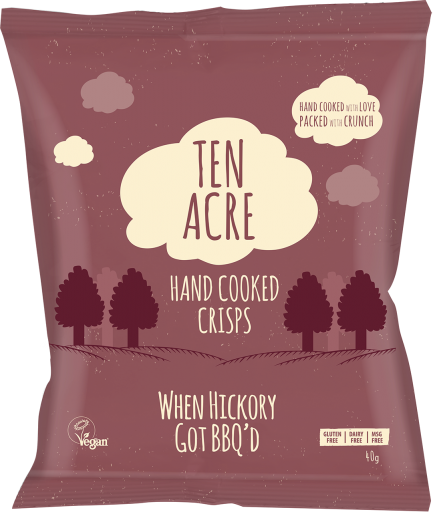 All of Ten Acre’s brilliant looking Crisps feature an abundance of curls and wriggly shapes. Some were so bent that they were folded in half. 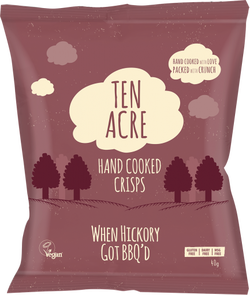 While Hand-Cooked Crisps based upon the traditional Kettle Cooking process always look more interesting than regular Crisps, these were a step above. There were also a plentiful supply of oil blisters and a fair smattering of orange coloured seasoning visible. It was difficult to know where to start with this flavour. Hickory is wood, so the flavour description on the bag was presumably attesting a flavour of barbecued wood! That is of course if you take the literal from the description – it would appear Ten Acre’s clever little descriptive terms rather than standard flavour descriptions took them down a path of no return, hence leaving them with this quite bizarre flavour, which on any other company’s bag may have included some sort of meat, possibly the word “Smoked” and hopefully, as a British brand, the word Barbecue rather than BBQ. Anyway, onto the flavour... There was no discernible flavour as such, but rather accompanying tastes to the overall flavour. There was a certain smokiness with the very slightest sweetness, but the overlying taste was of a mild Hickory wood.